An NTC (Negative Temperature Coefficient) Thermistor is a passive electrical component whose resistance varies inversely with temperature.i It is often used as a temperature sensor. The relationship between resistance and temperature can be described with the ‘beta’ formula. 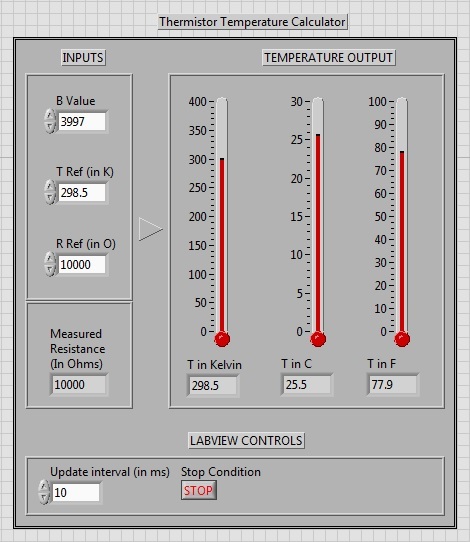 In this experiment we will show how to use the National Instruments myDAQii in conjunction with LabVIEWiii to create a Virtual Instrument that automatically and continuously measures the temperature. It is noted, however, that myDAQ/LabVIEW are not needed for the simplest form of this exercise, which can be performed with just a multimeter and a thermistor. The relationship between resistance and temperature is given by the ‘beta’ equationvi, a simplified approximation of the Steinhart-Hart equation.vii The Beta value (B), the Reference Temperature (T0), and the Reference Resistance (R0) are given in the thermistor’s datasheetviii. The component’s Resistance (R) is measured by an ohmmeter and then Temperature (T) can be solved for. 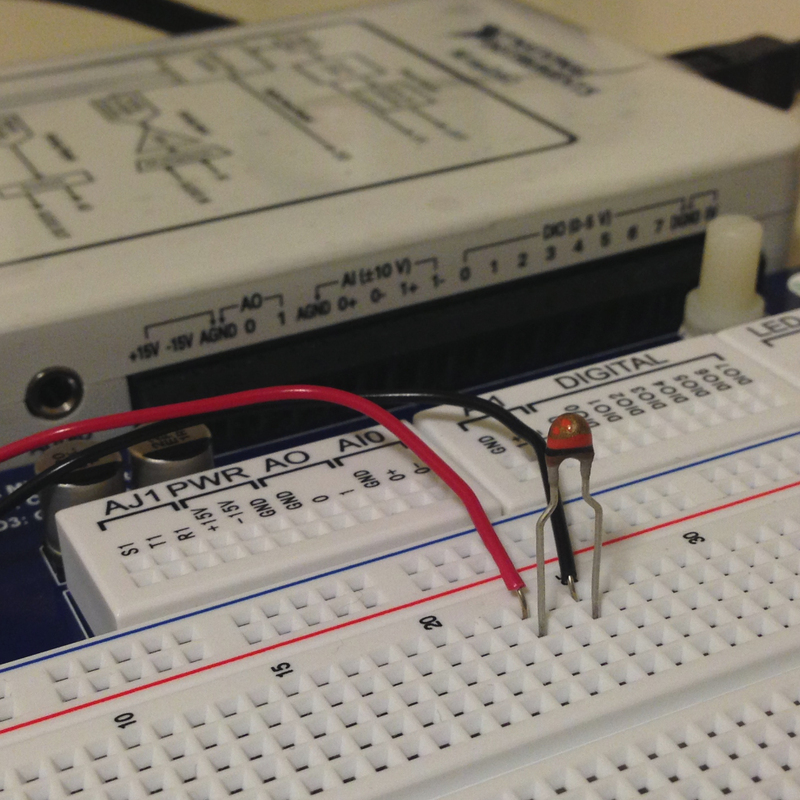 Simply attach the myDAQ ohmmeter probes to the thermistor which can be placed optionally onto the breadboard. The resistance will be measured by the myDAQ and sent to LabVIEW for processing. 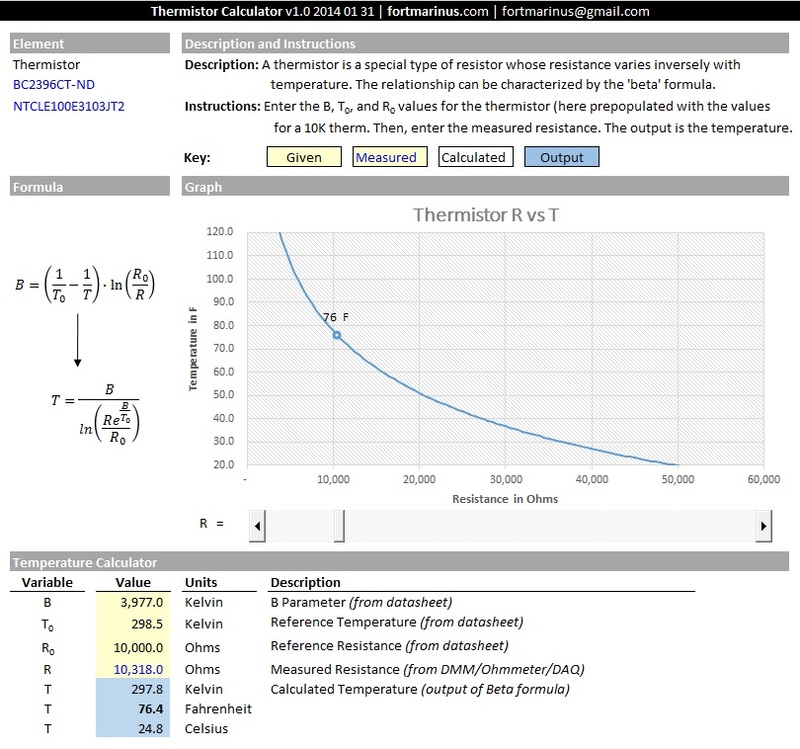 The Virtual Instrument Front Panel allows the user to input the Beta Value, the Reference temperature, and the Reference Resistance, again taken from the Datasheet. The resistance measured by the myDAQ is also displayed. The interface graphically outputs the calculated temperature in Kelvin, Celsius, and Fahrenheit. 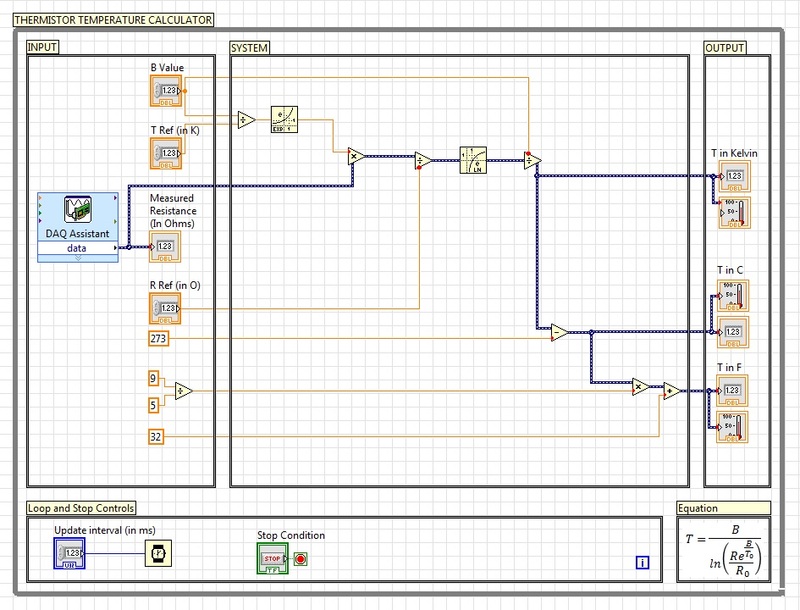 The block diagram is the programming language of LabVIEW and the back-end of the Front Panel. Each component on the Front Panel is graphically represented in the block diagram. The image shows how the variable inputs from the front panel and the myDAQ are passed through a graphical representation of the beta formula and then output as temperature values. If myDAQ and LabVIEW are not available, Excel can be used to calculate the temperature. In this experiment, we measured the temperature under the following scenarios: room temperature, surrounding the thermistor with a bag of ice, and grasping it while blowing hot breath on it. 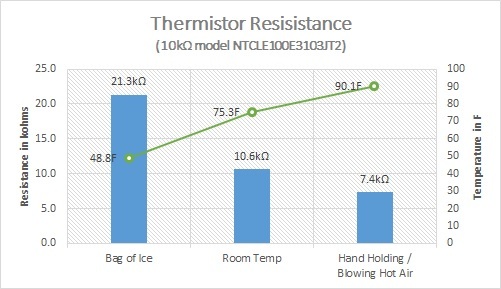 Indeed, the thermistor’s resistance is inversely related to temperature. This is a relatively easy experiment that can serve as a good introduction to circuit elements, data acquisition, and LabVIEW programming. Enjoy!